Q: I’d like to start a tropical bromeliad section in my landscape, but I have no idea if they’ll work in my Southwest Florida garden. What’s your experience with bromeliads? A: First, there’s nothing better than bromeliads to give a landscape a tropical look, so you’re going in the right direction. In general bromeliads are inexpensive (unless you purchase very mature specimens), easy to grow, require very little care, and reward the homeowner with brilliant, long lasting blooms (on stalks called scapes) and ornamental foliage where outdoor temperatures stay above freezing. 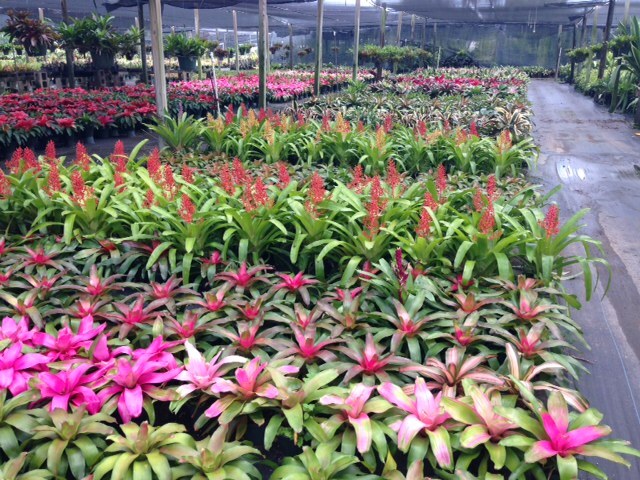 If you reside in a cooler pocket, plant bromeliads in a warm area or cover them when frost threatens. Some people even go to the trouble of planting the bromeliad in a pot and then sinking the pot in the ground. This allows for easy removal during cold nights, but it’s a lot of work! According to the Bromeliad Society International, bromeliads entered recorded history some 500 years ago when Columbus introduced the pineapple to Spain upon return from his second voyage to the New World in 1493. Within the last hundred years, bromeliads have become more widely used as ornamental plants. The most recognized bromeliad is the pineapple. Spanish moss (neither Spanish nor a moss) is also a bromeliad. But back to your question, bromeliads can be used in landscape designs in so many ways. They offer everything from vibrant foliage assortments to marvelous looking ground covers, so it’s really hard to go wrong with the right bromeliads. The best part is that bromeliads “pup,” which means they create new plants every generation that can be separated and replanted as a new plant. It’s the plant that keeps on giving! For more information, click here.